Switzerland - IOM reports that 29,811 migrants and refugees entered Europe by sea in 2017 through 5 April, with over 80 percent arriving in Italy and the rest in Spain and Greece. This compares with 172,353 through the first 96 days of 2016. IOM Rome spokesperson Flavio Di Giacomo reported that on Wednesday (05/04), a total of 755 migrants were rescued by MOAS’ ship “Phoenix” and the SOS Mediterranée “Aquarius,” whom IOM expects will be brought to land Friday (and not included in the table above). IOM Rome also reported another 1,355 migrants were rescued at sea on Thursday, and that the remains of one migrant were found by the Italian Coast Guard on a dinghy carrying 148 migrants. With arrivals to Italy topping the 25,000 mark, this year’s passage on the Mediterranean’s central route is running more than 25 per cent ahead of last year’s total at this same point. IOM Libya’s Christine Petré reported that on the morning of Thursday 6 April, the Libyan Coast Guard was called to a rescue mission off Az Zawiyah. IOM learned that when approaching the migrants’ boat, a smuggler’s boat appeared and began shooting at the coast guard vessel. There was an exchange of gunfire and one of the coast guards was badly injured. According to an IOM source, there were at least two smugglers killed and two others arrested. Additionally, on Thursday 138 migrants (120 men, 13 women, and five children) were rescued off Zuwara by local fishermen and coast security. The migrants’ boat had engine problems. All migrants were released following the incident and all are in good health. The total rescued so far in 2017 is 3,977 and 171 bodies retrieved. At this time, last year, IOM’s Missing Migrants Project (MMP) recorded 749 Mediterranean fatalities, nearly half of those occurring off Greece in the Eastern Mediterranean. In 2017, so far, 14 fatalities have been recorded on this route, with another 47 recorded off Spain and 602 documented in the waters between Libya and Italy. 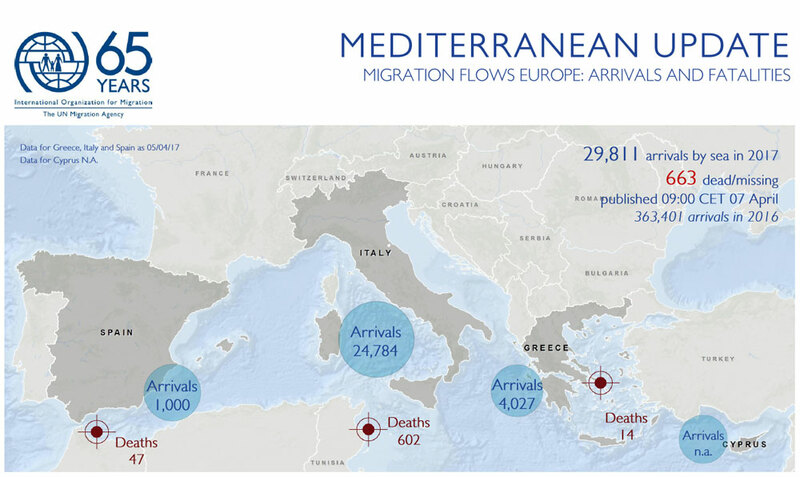 Worldwide, the IOM Missing Migrants Project reports that there 1,178 fatalities through 3 April (see chart, below), with the Mediterranean region accounting for the largest proportion of deaths – over half of the global total. This is 461 fewer than were reported at the same point in 2016. However, these data do not account for full reporting from North Africa and the Horn of Africa, two migration corridors where data collection tends to be slower than in other regions.